“The complainants have alleged that they beat up an intern on duty and also thrashed a security guard who came to intervene,” the SHO added. atna: JNU students’ union former president Kanhaiya Kumar and many of his supporters were booked Monday on charges of assaulting a junior doctor and a security guard of AIIMS here and snatching the doctor’s cell phone, an official said. The First Information Report against Kumar and his supporters was lodged at Phulwarisharif police station in western Patna on a complaint by the association of AIIMS doctors, Phulwarisharif SHO Mohd Qaiser Alam told PTI. 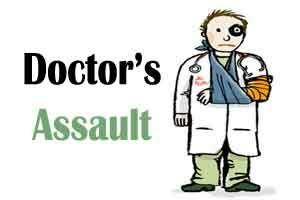 They also alleged that Kumar and his supporters snatched the doctor’s mobile phone also after beating him up, he said. The FIR has been lodged under various IPC sections related to assault, snatching and preventing a public servant from discharging his duty, he said. The Sunday night incident has triggered angry reactions from doctors of the super-speciality hospital. They have threatened to go on an indefinite strike if “proper action” was not taken against Kumar and adequate security arrangements were not made in the hospital. Asked about the incident, Bihar Health Minister Mangal Pandey told reporters, “I have talked to Patna AIIMS Director P K Singh and asked him to apprise me of the entire incident. We will take a call on what administrative action can be taken”. “This is not JNU where you can do anything and get away with it,” quipped the minister, a senior BJP leader. The minister’s remarks were in an obvious reference to the sedition charges slapped against Kumar over two years ago for allegedly raising anti-national slogans on JNU campus. The alleged incident drew condemnation from many political parties, including the RJD which had earlier expressed its willingness to support Kumar in the next Lok Sabha polls if he is fielded by a Left party. The former JNUSU president could not be reached for his comments. He was said to be away at his native place in Begusarai district. There had been speculations that the CPI(M) may field Kumar from Begusarai, a Left bastion till the 1990s, in the next Lok Sabha polls. The RJD, which does not have a pre-poll alliance with the Left, had expressed its willingness to support his candidature. I hope he is brought to book. He and his like deserve no mercy.